පසුගියදා බස්නාහිර පළාත් මහ ඇමති ඉසුර දේවප්‍රිය මහතා බප/ජය ශ්‍රී රාහුල විද්‍යාලයේ නම වෙනස් කර තම නම එයට අලවා ඇති අතර එයට විරෝධය දක්වමින් පාසල් සුරුකීමේ ජනතා ව්‍යාපාරය විසින් බස්නාහිර පළාත් ආණ්ඩුකාරවරයාගේ අවධානය සඳහා මාධ්‍ය වෙත නිවේදනයක් නිකුත් කර තිබේ. බස්නාහිර පළාතේ පළාත් සභාවට අයිති පාසල්වලින් සිසුන් 05කට වඩා අඩු වෙන් බදවාගත් පාසල් 69ක් තිබෙන බවත් පාසල් 19කට එකදු සිසුවෙකු හෝ බඳවාගෙන නොමැති බවත් ගුරුවරුන් දහයට වඩා අඩු පාසල් 275ක් තිබෙන බවත් පාසල් 50කට කිසිදු ජල පහසුකමක් නොමැති බවත් විදුලිය නොමැති පාසල් 14ක් මෙන්ම එකදු පරිඝණකයක් හෝ නොමැති පාසල් 421ක් තිබෙන බවත් පාසල් සුරුකීමේ ජනතා ව්‍යාපාරය සිය මාධ්‍ය නිවේදනය මගින් අවධාරණය කරයි. අධ්‍යාපනය දියුණු කරනවා වෙනුවට බස්නාහිර පළාත් මහ ඇමති සිදුකරන උන්මත්තක දේශපාලන සංදර්ශන හෙළා දකිමු. වසර 70කට වැඩි ඉතිහාසයක් හිමි මාදිවෙල කෝට්ටේ “බප/ජය ශ්‍රී රාහුල විද්‍යාලය” යනු අපේ රටේ (කෝට්ටේ යුගයේ) සිංහල භාෂාවට හා සාහිත්‍යට අමිල සේවයක් කළ පූජ්‍ය තොටගමුවේ ශ්‍රී රාහුල හිමියන් සිහිපත් වීම පිණිස ඉදිකළ පාසලකි. මෙම පාසලේ මීට පෙර සිසු සිසුවියන් 2000කට වැඩි පිරිසක් අධ්‍යාපනය ලබා ඇති අතර, නමුත් පාලකයන් අධ්‍යාපනය කෙරෙහි දක්වන නොසැලකිල්ල නිසා දැනට මෙහි සිසු සිසුවියන් 150කට පමණ සීමා වී ඇත. කෙසේ වෙතත් ජනතාවගේ බදු මුදලින් නඩත්තු වන මෙම පාසලේ පසුගිය අප්‍රේල් 01 දින ගොඩනැගිල්ලක් විවෘත කිරීමේ උත්සවයෙන් පසු එතෙක් පැවති නාමය වෙනස් කර බස්නාහිර පළාත් මහ ඇමතිවරයාගේ නම ඇතුළත් කර “ඉසුර විද්‍යාලය කෝට්ටේ” යන නම යොදා ඇත. මෙයට බොහෝ දෙනෙකු විරෝධය පෑවද එය නොතකා මහ ඇමතිවරයා සිය අභිමතය අනුව කටයුතු කර ඇත. මෙම ක්‍රියාවට එරෙහි විරෝධය එල්ල වනවිට අමාත්‍යවරයා තමන් නිවැරදිකරු බව ඇඟවීමට උත්සාහ දරමින් සිටී. ඇමතිවරයාගේ මෙම ක්‍රියා කලාපය අප සංගමය තරයේ හෙළා දකින්නෙමු. බස්නාහිර පළාතේ මේ වනවිට පාසල් 1359ක ප්‍රමාණයක් තිබෙන අතර සිසු සිසුවියන් 9,65,000ක් පමණ අධ්‍යාපනය ලබයි. නමුත් පළාත තුළ සිසුන් පහට වඩා අඩු වෙන් බදවාගත් පාසල් 69ක් තිබෙන අතර ඉන් පසුගිය වසරේ පාසල් 19කට එකදු සිසුවෙක්වත් බඳවාගෙන නොමැත. මෙයට අමතරව ගුරුවරුන් දහයට වඩා අඩු පාසල් 275ක් තිබේ. පළාතේ පාසල්වලින් 54%කට පමණක් ජලනළ පහසුකම් ඇති අතර පාසල් 50කට කිසිදු ජල පහසුකමක් නොමැත. එපමණක් නොව විදුලිය නොමැති පාසල් 14ක් මෙම පළාතේ තිබේ. එකදු පරිඝණකයක් වත් නොමැති පාසල් 421ක් පළාත තුළ තිබේ. මෙම සියලු පාසල් පළාත් සභාවට අයිති අතර මහ ඇමතිවරයා මෙහි ප්‍රධාන චූදිතයෙක් වේ. සැබෑ අර්බුදය මෙසේ තිබියදී එම ප්‍රශ්නවලට මැදිහත් වී නිරාකරණය කරනවා වෙනුවට මහ ඇමතිවරයාගේ මෙවන් පහත් පෙළේ ක්‍රියාකාරකම් හාස්‍යයට හා පුදුමයට කරුණකි. එම නිසා මහ ඇමතිවරයාගේ මෙම අත්තනෝමතික ක්‍රියාව වහා අත්හිටුවා දීර්ඝ ඉතිහාසයක් ඇති මෙම විද්‍යාලයේ නාමය පෙර පරිදිම සකස් කරන ලෙස පළාත් ආණ්ඩුකාරවරයාට හා මහ ඇමතිවරයා ප්‍රමුඛ වගකිවයුතු බළධාරීන්ට අවධාරණය කර සිටින්නෙමු ! We appreciate your work. This is a problem for our country. 1000 years old village name also changed by this kind of hum ban goons in the local council. These councillors are great mafia in our country. There is a road between IDH hospital and Angoda hospital called Mandavilla Road. This name is there for decades now the local council has changed it to Personal name. In Sri Lanka, we do not have great heroes to name. This is just one example but this re-naming issue is going on all over the country. Now we have to get a court decision not to change old names according to the local council. Local council with the help of RDA have filled all the wetlands in Colombo and the suburbs. Both these institutions are corrupt promoting slavery. We need to start a campaign to save the village names: save our wetlands: save our heritage. And also save our public lands from corrupt politicians and their backers. The corrupt and vain-glory ego building practice of giving politicians. name on publicly maintained buildings must be stopped. Acquiring public lands by political thugs must be stopped. Politicians should be banned from attaching their names to public institu tions. 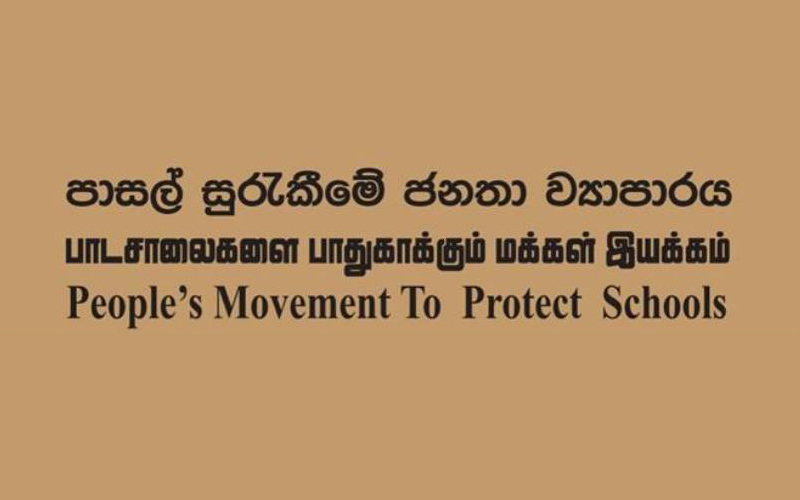 These political goons ( who have a rather short public life, enjoying all good things in life including tax free vehicles ) We have to ask this MAHA AMATHI why he should have his name for the school which already have a name( Well deserved) After all the school has been named after a well deserved Buddhist monk. These are the parasitic “politicians”. Who think very big of them selves. I suggest when some bodies name needs to be attached to an institution it shoul go in front of a selected people from that institution for approval .It should apply to all including the “president”. The other thing that irks me is thousands of billboards plaques that are opened mainly by politicians .A politician connected to building houses opens huge plaques ( which I think will cost at least a part of the house being built. What a scandalous waste of money. Another thing that surprises me is whenever a politician goes to a meeting there are hundreds of working people ( teachers,nurses ,office workers ) No wonder productivity in this country is negative. At this rate within a few years the country ( if not already happened)will go totally bankrupt.